OS X Mountain Lion, the 8th generation of Apple's desktop operating system and the elder brother with which iOS shares much of it's digital DNA, is now available in the Mac App Store. Most iOS users still use Windows as their primary desktop operating system. Even as the iPad is replacing traditional, lower-level desktop tasks like email, web browsing, and gaming for more and more of the mainstream, when it comes to proper old operating systems, Microsoft is still king. Yet Apple's choosing an incredibly interesting way to try and change that, at least for the users it cares about most. No, not you, geeky gaming rig guy in the basement. No, not you beleaguered beige box guy in the cubicle. No, not even you, media server maven guy with your house all wired. With Mountain Lion, as with Lion before it, targets the casual user -- that very same mainstream user who's gotten an iPad for many things, but still needs a traditional computer for some things. A car driver looking for a familiarly appointed truck. Familiarity is the key. Familiarity is a feature. Though they share many of the same underpinnings, OS X and iOS are very different animals. (One's a big cat, for starters.) Yet Apple understands that, for the user, the interface and the experience is the app. So with Mountain Lion, they've made more of the OS X interface and experience more closely match iOS than ever. Which makes sense, given the iOS user base not only dwarfs the OS X user base, but consists of the very users Apple wants to reach most -- those for whom traditional computers have always been inaccessible, intimidating, and off-putting. OS X Mountain Lion now sets up similarly to iOS 5 -- you enter your iCloud-associated Apple ID and almost everything gets done for you. It's not quite that simple of course, at least not yet, but it's vastly better than computers of even a few years ago. You still have to choose or take a profile picture, which is irksome to those of us who've used Macs with .Mac and MobileMe for years, and iCloud now, who'd really love to have the option to use our existing iCloud avatar. You also still have to fill out registration information. iOS skips both these steps, and for the better. All your stuff is "just there", and because Apple has made OS X apps sound, look, and even feel more like iOS apps, all your stuff is easy to find as well. With OS X Mountain Lion, Apple has continued to bring iOS concepts "back to the Mac" with mostly good, and in some cases excellent results. Gone are the iCal and Address Book of old, and in their place are Calendar and Contacts, just like iOS. They got an iPad-style makeover last year with OS X Lion, so this year the name is the biggest change. It may not seem like a big deal, but for an iOS user it makes them instantly recognizable and referable across Apple's platforms. Likewise, iChat has become Messages... and is more problematic. iMessage delivered a much-needed roshambo to the carrier price gouge that was SMS, and worked in a similar fashion. It was in context. It was understood. Even on the iPad, iMessages made some sense, even if dual-wielders had to put up with dual accounts (phone number for iPhone, Apple ID for iPad and iPod touch) -- and dual alarms! (iOS 6 will fix this by allowing phone numbers and Apple IDs to be merged for iMessage and FaceTime.) On OS X, however, the iMessage/iChat hybrid is messy. On one hand, if you're working on the Mac, it's faster to respond to iMessages on the Mac than to switch devices and do it on the iPhone or iPad. On the other, holy triple beeping hell, Batman. I've turned off alerts for iMessage on everything but my iPhone, since it's always with me. That way I only get one notification, but can reply from the device of my choosing. A more elegant solution from Apple, however, awaits. Added to the built in OS X app suite are Notes and Reminders, which now exist and do on OS X what they done on iOS since versions 1 and 5 respectively. They're no more or less than any iOS user would expect, but being able to expect them on the desktop as well as mobile is significant. Safari, meanwhile, has lost the separate search field and now has a unified bar for URL entry and search. Google Chrome pioneered this and Apple has copied it, no doubt to delight of many. I've never been a huge fan but I've gotten used to it, and it's nice to have Safari and Chrome on the same page for those of us who switch frequently between them. Also gone, to my immense consternation, is Safari RSS. Not just the ability to use Safari as an RSS reader gone (which was handy on occasion), you can't even open an RSS file to look at. Apple tells you to go jump in the Mac App Store and buy an app. Removing RSS from public view is one thing. Preventing your web browser from opening files is another. For shame. On the plus side, Apple has given Safari for Mac the outstanding Action button from iOS, so you can easily share a web page in a variety of ways. I used to close my Mac and pick up my iPad just to share links in a non-frustrating way. Now, if I happen to be on my Mac, it's just as easy as if I was on iOS. Also like Chrome, iCloud will now sync your tabs between OS X and iOS, so you can leave home with a web page loaded, and keep up with it on the go. Or vice-versa. Just make sure, if anyone else has access to you Mac or iPad at home or at work, you stick to tabs you're comfortable with everyone seeing you have open. Notification Center has moved from iOS to OS X and... actually works better on OS X. In iOS, Apple copied the base functionality of Google's pre-Android 4.1 notification window shade, but hasn't gone much beyond that. Rollovers still block buttons, and annoyingly to designers, linen appears in an overlay interface element rather than a background element. On Mountain Lion, a two finger swipe from the right edge of the trackpad moves the desktop aside to reveal Notification Center behind it. Notification appear as overlays at the top right of the screen and are even less obtrusive than they are on iOS. They're still not actionable, however, and that's where Apple is behind Android today, and webOS from years ago. Hopefully that's addresses in a future version. Having a notification appear and being able to quickly adjust controls or jot down a response without switching apps is the way it's meant to be done. The single biggest feature for me in Mountain Lion is AirPlay. Anyone who owns a Mac and an Apple TV will instantly attach to AirPlay on OS X because, like me, they will have wanted it forever. To be able to play any video on your Mac, or view any screen, and at the click of a menu button have it instantly beamed to the big screen TV is one of the Holy Grails of geekdom. And for the most part, it works great. One of the other Holy Grails (greeks are demanding, we have several), is cross-platform gaming. Mountain Lion provides that as well, with Game Center moving from iOS to OS X. If the same game is available on both desktop and mobile, and it's integrated into Game Center, you can race between iPod touch and Mac as easily as you could shoot between iPhone and iPad last week. It has its quirks, and it might take a while for developers to truly nail the experience between their apps, but it's fantastic. If anyone had any reason to even consider not getting Mountain Lion, AirPlay and Game Center should have you clicking away your $19.99 right now. Note: Some older Intel Macs won't get AirPlay in the update, which is beyond annoying. 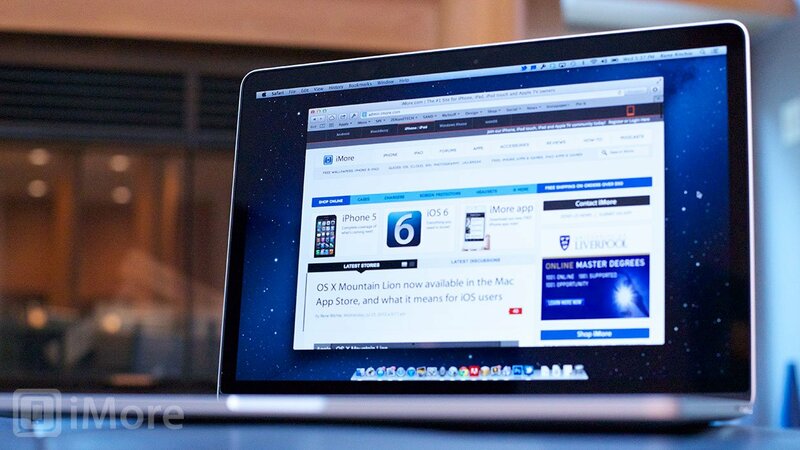 If you use them, Apple has integrated Twitter and Facebook into Mountain Lion. Since Apple has struggled with their own social networks, and appears to have no interest in owning social the way they own the core OS and cloud, it was a good choice, and works well enough. Previously, OS X on the Mac was the polar opposite of iOS when it came to how you could install and run apps. On iOS, unless you jailbreak, the App Store and the App Store alone is where you get your apps. With OS X Lion last year, Apple introduced the Mac App Store, but left the traditional, 3rd party vendor system in place and untouched as well. And yeah, phew. However, the iOS approach is safer, easier, more secure, and carries other benefits, especially for a mainstream customer. So with OS X Mountain Lion, Apple is giving users a choice. Well, three choices actually. Only allow apps to be installed and run from the Mac App Store and signed, certified developers. Allow any apps from anywhere to run. For those who are internet savvy and fancy free, option 3 means the Mac will behave as it always have. For those for whom software on the desktop has always been a scary mess, option 1 makes it as close to iOS as possible. If not win/win, it's absolutely tie/tie. There's no Siri in OS X yet, but like the new iPad with iOS 5.1, there is Dictation. For those of us who've grown lazy typing thanks to Siri and Dictation, that's welcome news. I'm not sure OS X is similar enough to iOS that I can recommend everything go out an update immediately, like most of us do with iPhones, iPod touches, and iPads. Computers are trickier beasts with more moving parts. If you aren't a comfortable, confident, early adapter (who is likely already on a pre-release version. ), wait a while. Wait a day or a week until any problems have been identified and fixed. Wait a month or more if you have mission critical software that you can't have fail on a new OS. Apple is on yearly OS X update cycles now, just like iOS, but the same old computer advice applies: slow and steady wins the reliability race. Apple touts over 200 new features in Mountain Lion, including many specifically for the growing Chinese market. For me, it's not the number that matters but the nature. Making OS X look and feel more like iOS is a smart play by Apple. Previously, anyone getting into the Apple ecosystem via an iPhone, iPod touch, or iPad might have looked at a Mac and seen something just as alien as a Windows PC. Now they'll see something just as familiar as their iPhone, iPod touch, or iPad. Now, there's actually a reason iOS users, especially mainstream ones who are new to or have never been comfortable with traditional computers, to choose Mac over Windows -- it feels like just one more iOS device, a more capable if complicated one. It feels like a nicely appointed, leather stitched, linen-lined truck. Sure, some element of the market has always had a compelling reason to choose Mac -- it was prettier or friendlier or simply fit the way they worked better. But many didn't. Many went with Windows for reasons every bit as legitimate to their feelings and needs. Apple may not convert many more Windows devotees to Mac with Mountain Lion, but they'll convert or simply attract a great percentage of those who previously had no strong loyalty one way or another. They'll get the iOS using mainstream, and that's good for both Apple and mainstream computer users or users-to-be. I had my mom try it out this weekend -- my version of the ultimate usability test -- and even though she's been using Lion for year, she found it immediately more relatable simply by virtue of the similar apps. That's no doubt what Apple was going for, and what they've achieved. And for those worried that Apple is "dumbing down" the Mac for iOS users -- you still have Terminal. You're fine.